This is a lovely vase by Tuthill. It is signed on the base with the Tuthill trademark. 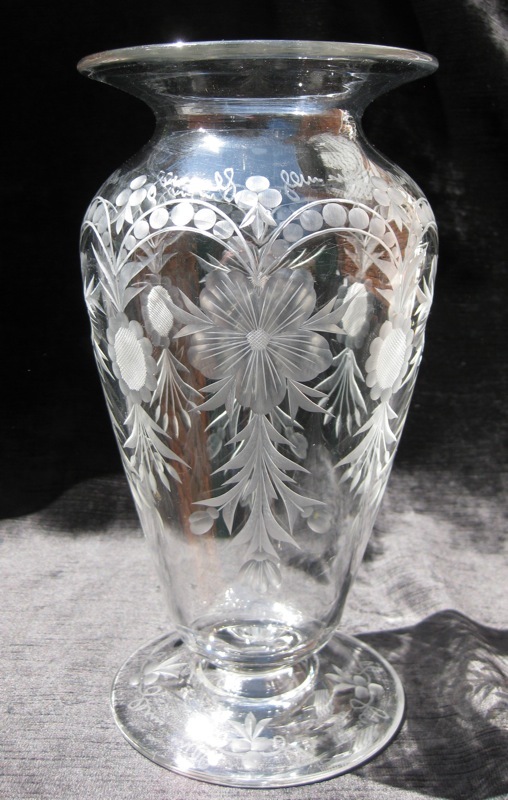 The vase is footed with a very elegant shape with neck pinch and rim flair. I believe the name of this design is Phlox. Gorgeous engraved flowers dangle from arching borders – the flowers are filled in with crosshatching. These borders are filled with seven small circles and topped with a viney border. In between each flower is a silvery medallion with additional draping foliage. The base is engraved with more of the vines and three small circles with leaves. The vase is in perfect condition with only some minor scratches to the base. The blank is very clear and measures 9 3/4″ tall and 5″ wide.